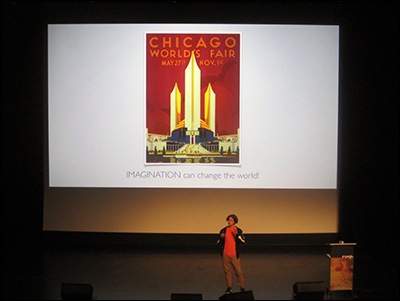 The 8th Cusp Conference was held on October 7th and 8th in Chicago. Its lens is wide, on purpose. The contrast between speakers—their culture, their passion, their discipline, their point in life, is high in order to broaden one’s exposure to practitioners and their chosen focus. Though each presentation is a short-lived slice into a topic, most probably never known before, let alone investigated, the effect is curiosity stimulated. And curiosity is a human quality in need of nourishing. Mike Ivers, President and CEO of the Yuma Community Food Bank, and a staple Cusp Conference lead speaker, set the annual gathering’s tone by invoking a long-term challenge: “Embrace the storms.” A bold invitation to bear witness to the unexpected, the inevitable, and to take advantage of this act as a tool to produce something great. 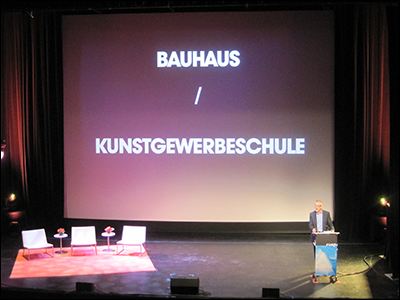 This charge was echoed by each presenter of Cusp Conference 2015. Each chose a storm of instability and claimed it as their personal duty by taking on the storm—with a storm of their own. Ivers was followed by Mary Cummings, one of the U.S. Navy’s first female fighter pilots, who is witnessing robotics encroaching on the human skill set. 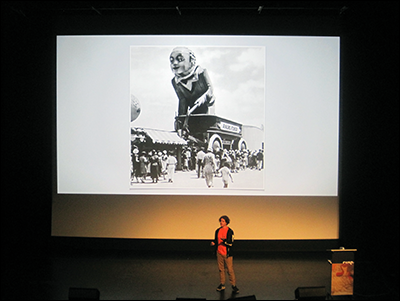 As the director of the Humans and Autonomy Lab in the Pratt School of Engineering at Duke University, she and her team study the evolving interaction between humans and machines. Their focus is on the social and ethical repercussions of this dynamic. 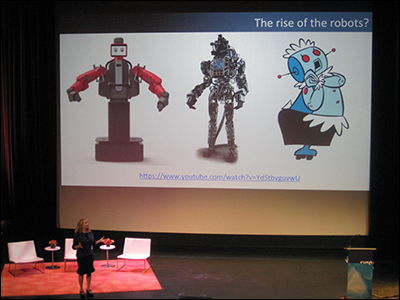 On one of her slides showed the header: “The rise of the robots?” An open question. My reaction: No longer a question, it’s a fact. In adjusting Cummings’ question from an Asimov angle, per his first rule of robotics: Will the rise of robots be benevolent? An attendee I met at last year’s Cusp Conference discussed with me how automation is affecting his job as a software developer. I believe that the world of code, even when virtual robots are used for diagnostics and repair, constitutes an art. It’s this aesthetics of appreciation and application that humans possess in idiosyncratic spades (for now). The aesthetics of transcending boundaries (e.g. geography, politics) was upheld by Howard Belk, Co-CEO and Chief Creative Officer of the global branding agency Siegel+Gale. He announced a new project called “Border Crossing” organized at the University of the Arts in Philadelphia. This multidisciplinary program, influenced by the timeless unifying current of the Bauhaus, was conceived as an active anchor of culture in “The City of Brotherly Love.” The envisioned participation in this initiative connects with one kindred example I heard about recently on National Public Radio: the new cultural center, Centro Cultural Kirchner, in downtown Buenos Aires, Argentina, whose Culture Minister Teresa Parodi proclaimed, “Culture is an investment for this government, not an expense.” In the drive to further cultivate Philadelphia as a remarkable epicenter of ingenuity through their “Border Crossing” ambition, Belk speaks to the positive energy that cities, with their evolving infrastructure, could harness and circulate. The collaborative spirit continued with glass artist Joel Berman’s studio, where his team reflects a tapestry of cross-cultural imagination in pushing the pliability of glass (above). It was impressive to hear Berman’s ethnic diversity in his business, which fulfills social entrepreneur and other Cusp Conference speaker Eve Blossom’s description of a company as a “container for collaboration.” From Berman’s mentions of spirited discussions and enjoyment of different cuisines, his business can be portrayed as a neighborhood block party of collaboration. Social innovator Samantha White delivered a strong and seamless monologue. Her amulet from childhood into the present day was a collection of plays by Shakespeare. She turned her sanctuary in the Bard of Avon’s stories into a mobile theater for the people in Detroit—aptly named Shakespeare in Detroit. 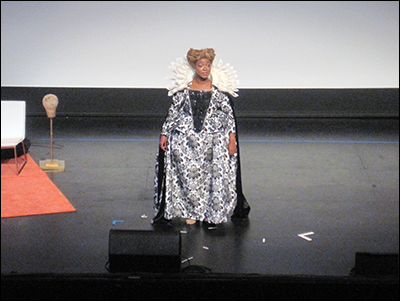 On the Cusp Conference stage, she relied on timeless Shakespearean methods of expression: thoughts, voice and eye contact. Standing still, beaming tall like a poetic siren. A compelling reminder that words—written, spoken—carry in value and unfold in meaning. The vibrations of words can prove lasting. The volume of words matters. Romanticism: mystery, spontaneity, wonder. A sense of awe to complement the number-crunching, results-driven personality of business. Romanticism is a tonic to keep the cold, hard math of business warm to the touch. It was refreshing not only to hear Leberecht’s emphasis on the shades of emotive communication, aligned to romanticism, but to also hear the need for both worldviews: entrepreneurialism and romanticism. Though the two can certainly eclipse one another, their benefits are best reaped when both are joined, as opposed to an either/or model. History is a glorious recorder and a residual teacher. Archbishop Desmond Tutu distilled history to a vicious lesson: “We learn from history that we don’t learn from history!” Jessica Metcalfe tries to correct instances of this by being a champion of her own history as a Native American. Metcalfe is Turtle Mountain Chippewa. 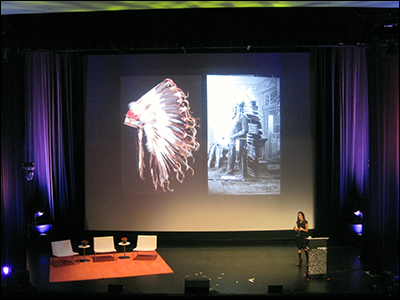 In addition to writing her doctoral dissertation on Native designers of high fashion at Dartmouth College and the University of Arizona, Metcalfe created Web-based destination “Beyond Bucksin,” focused on bringing and spreading awareness to Native American-made clothing and accessories. Metcalfe’s advocacy of her cultural heritage isn’t rote preservation, it’s sensitive vigilance. To help keep the legacy of her culture intact, Metcalfe makes sure her background is in the foreground, with precise respect, through diligent historical examination and curation of Native American craftspeople. A refrain was the critical integrity of cultural authenticity. She reminded us to be sensitive to a group’s language and narrative when adopted and simulated. I sensed tension during Metcalfe’s presentation, between the stewards of a culture and those who, with and without intent, overlook a culture’s deep heritage. I wondered if there is a threshold to mine and govern cultural details, particularly in the midst of phenomenal practices like collage, remixing and sampling. There are general observations accumulate with ease. Most disappear. Some remain present long after having been observed. They become specific in their nature. Specificity feeding clarity. These are the observations that somehow gel with possibility. They turn into a project, even reaching the status of a quest. From observing her grandfather with Parkinson’s, Lily Born (above), who was 8-years old at the time, took note of his difficulty in drinking liquids. He often tipped his cup. Born turned her observation into a challenge taking the form of the anti-spill Kangaroo Cup. Now 12-years old, Born is pursuing her other ideas in helping to improve people’s lives. Matching the situational awareness of Born, Dominic Wilcox observes common objects and their afforded context—turning both into material flights of fancy. Ordinary objects imbued with extraordinary contexts. While being charmed by his inventions, such as the first GPS-equipped shoes to the dual cereal crane and milk lubricant (broadcast on “The Late Show with Stephen Colbert”), I was dubbing Wilcox as the da Vinci of delight, unexpected and welcomed. Composer Victoria Deiorio creates soundscapes for the theater and the big screen to help audiences experience music in original ways. Whether it’s a play or a movie, sound gives ambient weight to the flow of stories. She imbued the auditorium with samples of her work. No visuals, only the effect of sound. Slices of her musical scores were matched with a scene she narrated. After the conference, I happened upon the new album “Tape Loops” by Chris Walla of the band Death Cab for Cutie. Its analog arrangements and instrumentation, using piano and electronic keyboard, sparked a meditative quality. It was a fitting discovery aligned to Deiorio’s presentation. I shared it on social with Deiorio who tweeted back: “This is why I love what I do… making people think about what they don’t normally think about.” I dwelled on the phrase “normally don’t think about.” Because there is the typical sight of Apple’s iconic white earphones. Beats’ colorful headsets are also a popular sight. The Web is a massive sonic gallery, which includes curatorial destinations like DesignersMX where you can “Create finely-curated mixes with music that moves and cover art that’s beautifully designed.” The state of engineering has enabled a world of sound. This is particularly apparent in efforts to record and study the creative, social, political, historical dimensions of sound, such as Aporee, “an online audio archive where people upload field recordings” from all over the globe, the series “Close Listening” by National Public Radio dedicated to identifying sounds in nature, and the Library of Congress’ plan to preserve the “Sounds of America.” Speaking to a packed audience at the 41st monthly meet-up of the Chicago chapter of CreativeMornings, sculptor and luthier Ian Schneller showcased his making of one-of-a-kind horn speakers, which could be inserted into stories of the steampunk genre. There is also the relentless wave of sonic selfies. A glowing example of which is the non-profit StoryCorps, whose recording booths have documented the many experiences composing the oral history of America. This audio tapestry has been advanced with the launch of a mobile app. Furthermore, there is the sound of the Big Bang. More than these amazing feats of audio access, there is the affectionate reverie uniquely possessed in the sound of a loved one’s voice. This is equivalent to kissing a photograph, holding hands, a salute, or feeling for temperature. My belief is that the human awareness and invoking of sound, in life, in art, is a normal mode. 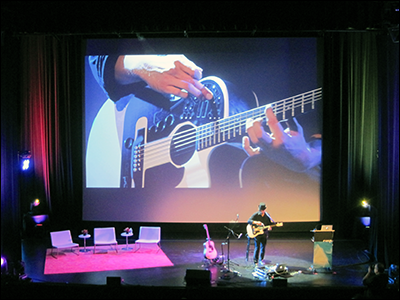 Musician Robin Sukroso shared with the audience how he expanded the range of a single instrument. In his case, the guitar is his maker’s studio. Leveraging the latest availability of electronic components, he invented the ACPAD, the world’s first wireless MIDI controller, attachable-with-ease for the acoustic guitar. This seamless device equips him with a variety of effects, in percussion and textures, marrying music done by hand and music done electronically. A one-person band. Sukroso’s ingenuity with musical instruments recalls musical duo Buke and Gase, whose distinct sound is due to their handcrafted instruments (that inspired their name). Producing the sounds in their heads through musical instruments of their design. 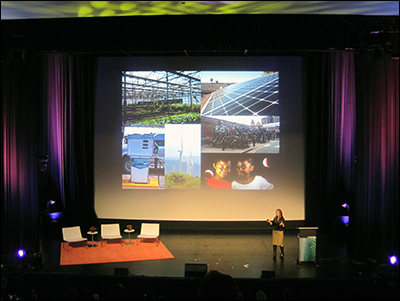 Amidst the merciless storms of consequences worsening our planet, environmentalist Suzanne Hunt shared some “bright spots” of human intervention to cope, even counter, the terminal effects of pollution. The source of these noble attempts is “Will,” as Hunt revealed. The execution of nobility boils down to this factor, ever-elusive, at the same time, ever-accessible. 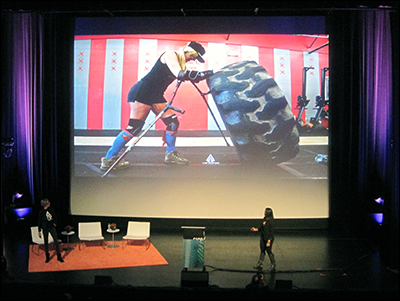 Exercise of will is both the proposition and pride of I Am Adaptive™, a non-profit co-founded by crossfit trainers Marilyn and Ellyse Zosia, who took the Cusp Conference stage to share their plights in overcoming personal struggles. Their saving method: physical fitness. They champion a crossfit community, guided and nurtured to help overcome disabilities: emotional, mental and physical. 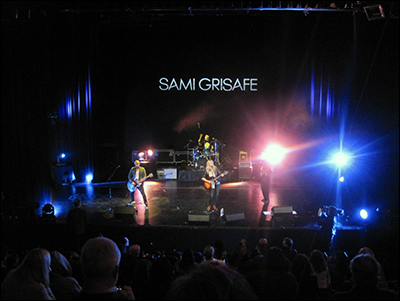 As an athlete, singer-songwriter and actor, Sami Grisafe is a captain of will. She closed the Cusp Conference with her story of pursuing goals others could not intuit readily, such as being the first female to play the quarterback position in a varsity Division I football game in the state of California, the first female to throw a touchdown pass in a world championship tournament, and the first girl in her community of Redlands, California, to join a boy’s baseball All-Star team. Currently, she is recording her new album supporting both the LGBTQ community and the right of marriage for all. These events testify to an epic tale of will, if used, can contribute to a different, ultimately positive circumstances through which to excel and seed the next experience. Grisafe’s telling of her origin story led me to my conclusion, that she pushed herself out of her mother’s womb—fighting alienation since the moment of birth (recalling biological anthropologist Julienne Rutherford’s Cusp Conference 2014 talk about the placenta as the defining force of human life). Hunt’s phrase “bright spots” remained with me as an essential summary of the 8th Cusp Conference. Each presentation related trials of varying magnitude. Most too big in scale for human comprehension, too big for human engagement, too big for human imagination. 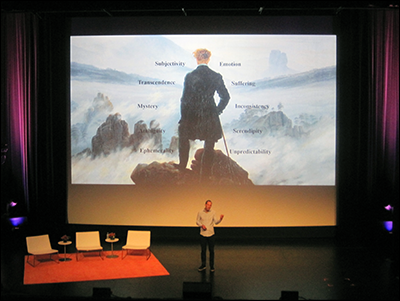 Echoing previous gatherings, the 8th annual iteration of Cusp Conference in 2015 delivered proof of defiance to the residual perception of any problem, whatever its composition, being too complex for human effort to put a dent in. 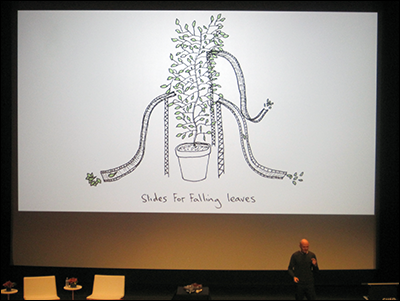 From the never-ending assembly of wicked problems, each presenter picked a place to invest their energies and stuck with it. This stickiness goes under various names: persistence, courage, perseverance, including the much propagandized label of empathy. 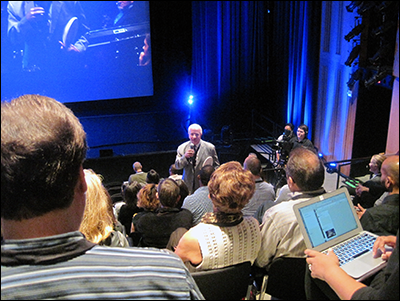 The 8th Cusp Conference offered another big morsel of human demonstration. Each presenter: part storm chaser, all parts storm facer. Each left a unique impression. Together, they left an imprint for any attendee to inherit: Make your storm of interests your strength—in the process, granting a piece of the world a second life. 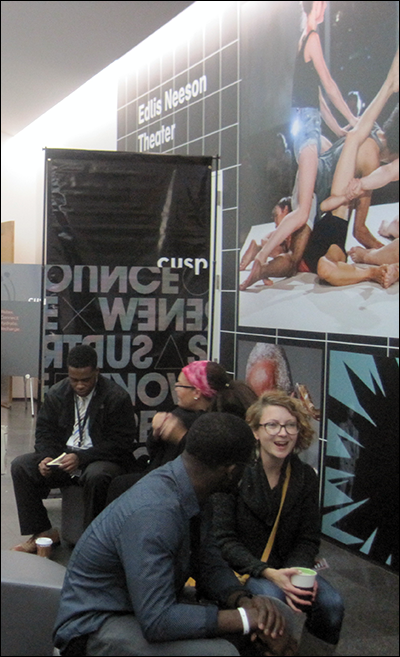 Big thanks: to Multiple, Inc., and the volunteers who made Cusp Conference happen in 2015; to the Museum of Contemporary Art, in Chicago, for hosting. 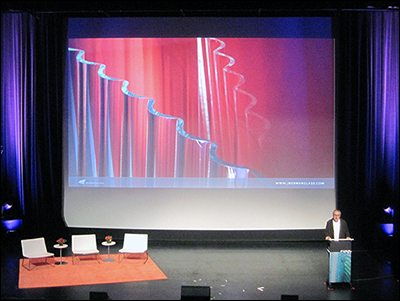 See more of my photos, including anticipation, of the 8th Cusp Conference. 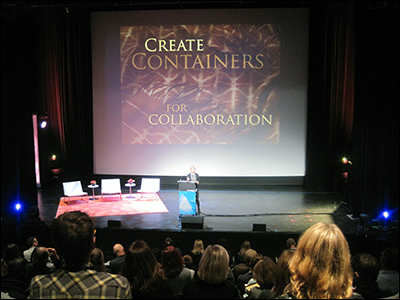 Furthermore: my write-up and photos of the 7th Cusp Conference in 2014, plus my write-up and photos of the 6th Cusp Conference in 2013. 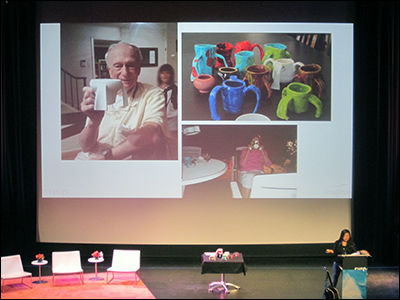 Read more of my coverage of events related to design and creativity.